After the successfull first edition of last year, The Flemish Primitives food seminar was again organized this year on Feb 8th by The Flanders Taste Foundation, an association created to promote belgian gastronomy and the research in new technologies who could help chefs in their quest for pure and natural taste. Food pairing was the theme last year. The focus is this year really done on technology with the presentation of 5 world premieres. The event is taking place in one day, but this time, we had not only a very intense agenda on the main scene, but also some break-out sessions scheduled all day long. Intense, i told you. A main difference compared to last year : the kitchen is not located backstage anymore but on the middle of the main scene. Good point. 9:30am. Around 1250 guests have found a seat in the auditorium… ready for the show. Peter and Bernard are welcoming the guests while Peter Goossens (chef of 3* Hof van Cleve) is introducing the day. And the program starts immediately with a world premiere : chefs Filip Claeys (1* De Jonkman) and Rudi Van Beylen (Hof ten Damme) are presenting a machine who « cook » under the ultra high pressure : well, cook is not really the word as there is no use of temperature but a pressure 6000 bars corresponding to a pressure equal to 60km under the sea. Using this technique (only available for industries for the moment), shells or oysters are not only seeing their taste enhanced but also their conservation duration extended. And cherry on the cake, flavours can be impregnated (like champagne) while the product is still enclosed in his shell. Each guest is receiving a sample of shells to taste in a small box : 9:37am and we are eating coques, palourdes, mussels… well, this looks like another world premiere for me. The result in mouth is indeed interesting : we are eating shells fished from 7 days old but the taste is really clean, pure and the texture is perfect. Even if there is only around 140 of such machines around the world – and not really adapted yet for a restaurant kitchen today, this truly opens new perspectives for the future. For the next presentation, the audience is watching San Degeimbre from 2* L’Air du Temps preparing a dish inspired by the Korean tradition : Kimchi, dish including fermented vegetables, peppers and mainly based of cabbage. The scientific part of this dish is related to the fermentation process and is explained by Xavier Nicolai from the Meurice Institute. Next guests are the Roca Brothers, indeed, the 3 of them are there and are presenting some recent developments done in their restaurant. The pastry part, led by Jordi, is really impressive. Connexions between parfumes and food is clearly demonstrated here : for a selection of well known parfumes, a paired dish has been created in order to work on the same flavours. Wonderful dishes are shown on the wide screens. After the Roca Brothers, back to some more technical cooking methods : low temperature and cuisson « sous-vide » with on the scene Bruno Goussault from the CREA institute and belgian chef Wout Bru. They are explaining the limits and best practices of these methods and the impacts on the products cooked. Next, as a result of a survey, the 10 commandements of the Belgian gastronomy are presented… a list of commitments that belgian chefs part of the The Flemish Primitives have agreed to follow and respect. Next topic is a panel discussion (watch it here) handled by Jean-Pierre Gabriel about new trends in gastronomy like social networking. Our blogger danish friend Trine was invited to join the scene : not only to talk about Denmark but also to describe why bloggers are now part of the global picture talking about food and restaurant, blogging being a new media not only dedicated for customer information but also used for and by the chefs themselves. After the lunch break, it’s time for Sergio Herman (chef from 3* Oud Sluis) to come on the scene and present another world premiere innovation. In cooperation with the University of Louvain, a technology was created to move drops around on a plate. The advantage of this is that essences can be used in their pure form, without the need for any binding agent. This allows the chef to add flavours to a dish instantly at the customer’s table in a very attractive way. A demo is done on the scene, and if it looks indeed quite spectacular to see these bubbles moving alone, i wonder the impact on the taste and which improvements this is bringing to the dish from this perspective. Another great presentation was the one done by our friends from the Flemish Foodies. More than one year now that their blog does exist and their approach hasn’t changed, promoting 3 flemish chefs by sharing recipes on a weekly basis : Kobe Desramaults (1* In de Wulf), Jason Blanckaert (1* C-Jean) and Olly de Ceuleneare (Volta, opening planned this year). Kobe is cooking a pork dish on the main scene and is introducing one of the farmer who’s providing Kobe with local vegetables. Finally some cooking and back with the feets on earth. It was time for us to go backstage and have a look to what’s happening there. As last year, photographer Tony Leduc is shooting all the dishes of the day. Stephane from Cuisiner en Ligne is broadcasting live the event on internet. We take the opportunity to interview a few chefs in french : with the help of Bruno (Food Intelligence) as interviewer, San, Kobe, Bart, Filip and Rudy kinldy have accepted to explain for us their philosophy, their restaurant and what they have presented today. Back to the autitorium to attend Vicky Geunes (chef from 2* t’Zilte) presentation : use of a Nespresso machine without use of coffee. A recipe is cooked on the scene with beet juice prepared from a capsule and processed through the Nespresso machine. New perspectives again, very interesting. Next topic at the agenda : the Sommelier of the Year. Guido Francque is introducing the 10 nominees (one per belgian province) and the winner is Pieter Verheyde, sommelier at Hof van Cleve. 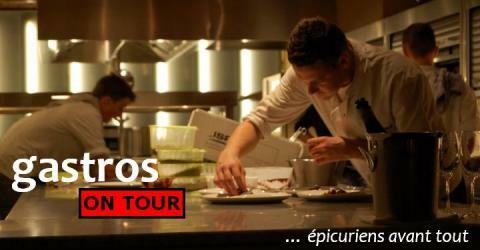 But we were on time back on the scene to see Bart (from 2* Pastorale) presenting his restaurant and cooking philosophy. Bart has completely renewed his restaurant and redesigned it with creations from Arne Quinze. Re-opening planned as from Feb 11 ! The next guests on the scene are Gert de Mangeleer (chef from 2* Hertog Jan) and Sander Goossens (from Pierre Gagnaire restaurant in Courchevel) who are cooking 2 different dishes with the use of 7 same ingredients. After that each chef has explained his dish, both are now creating together a third dish based on some components of each of the previous dish. Next one on the scene was Roger Van Damme, from Het Gebaar in Antwerp, chef of the year for the belgian Gault Millau guide, who presented another world premiere : the EmulsionFire. In cooperation with the University of Leuven, he has created a new way of making emulsions by using magnets. The advantage of this process is that new textures can be created or that existing structures can be created in less time and can be preserved for a longer period. Watch Stephane’s interview here. 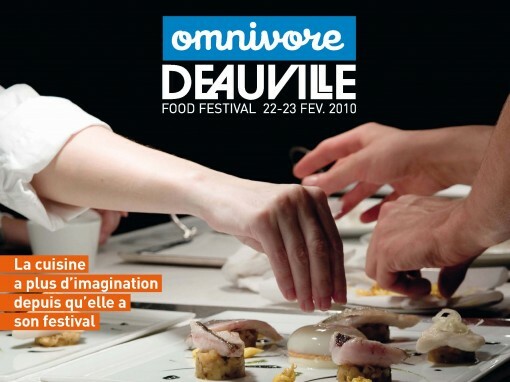 Roger Van Damme will be on the scene of the Omnivore Food Festival in Deauville on Feb 23, don’t miss him there. And last but not least, as last year, Dominique Persoone from the Chocolate Line in Bruges had the privilege to close the day, together with James Petrie, pastry chef of the Fat Duck. Chocolate rockets or spaceships, « boule à facette » in chocolate and in levitation, these guys are not only cooks or pastry chefs, they are also great entertainers. Each guest receives a box with 2 chocolates, delicious bites there to close a great day. Compared to last year, this event was much more focused on technique and new technologies at the service of the chefs. With as a result less recipes, less cooking done on the scene, less « gourmandise » some have said. It is becoming clear that the goal of Flanders Taste Foundation and this event is to promote belgian gastronomy and they wanna do it via this technological orientation which clearly differentiates this event from other similar events in the world. And it’s now a fact that this event has reached without any doubt another dimension this year. We have seen things we would never expect the existence before, we have seen some findings opening new perspectives for the chefs in a near or mid term future. Bernard and the whole organization team have done a tremendous job by gathering all these chefs, scientists and guests together for this unique day of gastronomy and innovation. And this is something that Belgium can be proud of ! Thanks guys, looking forward to next year !